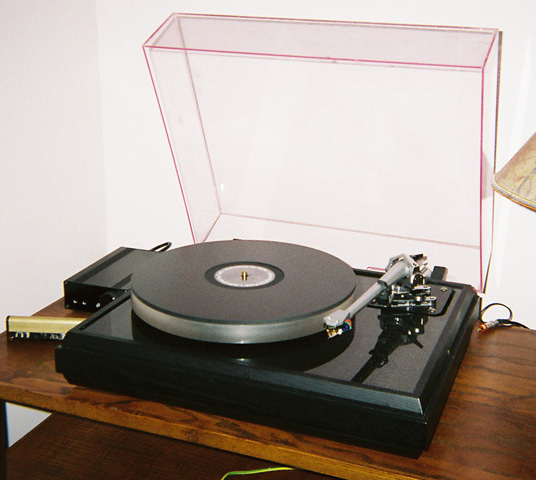 Pink Triangle released their original turntable in around 1980, and this was radically different from the "standard" high-end turntables at the time like the Linn LP12. It had a very stiff and lightweight construction, including the unique "Aerolam" honeycomb aluminium subchassis and the patented acrylic platter, which was claimed to create a much more intimate path for vibrations and well-controlled damping. It hung the subchassis from springs (instead of it sitting precariously on top of the springs in the Linn and other similar decks) and used an innovative inverted bearing, both of which led to a more stable moving assembly than the Linn. Finally, it used a DC motor with low torque, which was rather quieter than the then standard AC synchronous motor, although for various reasons this was later dropped for the PT TOO. I intuitively like the design philosophy of the Pink Triangle decks, which seems to be based around low mass and very tight vibrational coupling along the chain consisting of the LP, the platter, bearing, subchassis and arm base, at the same time as the right amount of damping in the right place (here it happens mostly in the acrylic platter). I have always had a suspicion that the Pinks were designed by a physicist, rather than an engineer - the obsession with high mass among many European and American high-end turntable manufacturers, and likewise with the lossy felt mats used by Linn and Roksan and others, strike me as rather inelegant patches for problems that have much more appropriate (if perhaps elusive) solutions. Pink Triangle were also pioneers in using comparisons with master tapes of recordings as a criterion for sound quality, in stark contrast to the later Linn dogma of "following the tunes", which always seemed to imply that the recording could somehow be improved upon. I bought my PT TOO back in 1989, and it was my first "high-end" turntable, replacing a Rega Planar 3. I went to several local dealers for demonstrations, listening mainly to the Linn LP12 and the Roksan Xerxes, as well as the PT. I preferred the Pink Triangle over the main competitors: the Linn was very listenable, but sounded muddled and tonally wrong to me on orchestral music, while spending and hour with the Roksan left me with a headache - it was tremendously impressive, but I felt the detail was being thrown at me in an unnatural and almost aggressive way. The Pink had the detail and presence of the Roksan, at the same time as the natural ease of the Linn. In the seventeen years since then I have grown to appreciate my Pink even more, as it presents a very believable sonic picture of the performers and seems to me to be faithful to the recording across a wide range of genres. It clearly shows the differences between different recordings, without making poor recordings or pressings - or noisy second-hand records - unpleasant to listen to. Incidentally, this is to me one of the big strengths of the analogue vinyl medium over CD, which in my experience has a tendency to homogenise recordings in a sometimes almost subliminal way. My PT TOO has seen me through two arms - after about five years I moved up from the Rega RB300 it arrived with to the impressive SME Series IV - and a handful of cartridges, but in all that time it has just reproduced music unobtrusively and enjoyably. For me it has, nevertheless, one or two quirks, some of which affect the sound quality. Its pitch stability is not perfect, and although most of the time this was no problem, it is quite dependent on the setup and support of the deck: in particular, it is affected by the height the belt rides on the inner platter surface, as well as by the stability of the surface it stands on. The pitch is also affected by any bounce of the suspension (often shortly after lowering the stylus onto an LP). The steel top plate sounds slightly resonant, as is the flimsy plywood base under the plinth. I was occasionally aware of slight motor noise, not only when I stood close to the deck, but also when it was picked up by the cartridge via the belt and suspension; this was mitigated partially by Pink's installation of a thrust pad on the end of the motor, but for me this is still a fault that ought to have been remedied by a higher quality motor. Finally, I always felt the speed change push-button on the top plate was ergonomically naff, as turning the deck off from 33 RPM meant changing perforce through 45 RPM on the way. It turns out that most of these problems - particularly the speed stability, the motor noise and the resonances - had been potentially solved in Pink Triangle's top deck, the Anniversary, which was released just after I bought my TOO, and which received unanimously positive press reviews. I heard one at a demo at KJ West One in London, and the Annie indeed sounded to me distinctly quieter and more pitch stable than the TOO, but unfortunately much as I lusted I never had the funds to buy one. This is the new London-based company headed by the original Pink Triangle designer, Arthur Khoubesserian. They offer a couple of very well-reviewed mid-price decks, named simply the Funk and the Funk Vector, and which look to me a little like a melted-down offspring of Pink Triangle's final deck, the Tarantella. They also sell the Achromat, a 5mm thick foamed PVC mat which is intended to improve on the coupling between vinyl and platter, and which can be used on anything from a Rega to top audiophile turntables. As well as producing strikingly original turntables of their own, Funk keep up the tradition set by Pink Triangle's controversial Pink Link modification for the hallowed Linn LP12. This involves the replacement of the AC motor with Arthur's preferred DC motor, and displacing the position of this on the Linn's top plate to the corresponding seven-o'clock location of the motor on the Pinks, which was claimed to reduce the effects of motor noise in the direction in which the cartridge was most sensitive to vibration. Funk still modify Linns, and can install their patented Vector Drive system, which adds a couple of pulleys to the top plate to stabilise the belt drive to the platter. As well as this, though, they offer a three-stage modification service for original Pink Triangle decks, which they claim takes their performance significantly beyond the original Anniversary. The first two stages involve changing the AC motor to a quieter DC one, replacing the steel top plate with a more inert carbon fibre sheet, installation of the three-layer subchassis from the Anniversary in place of the existing Aerolam item, and the addition of an Achromat on top of the acrylic platter. The final steps are to move the motor into the subchassis, as in the Anniversary, supplying this from a servo control system, and the addition of the extra pulleys for the Vector Drive. The Vector modification should give noticeable improvements over the original Anniversary, although the new version lacks the "Flexi-link", which was a very thin and flexible connection in the Anniversary between the arm base and the phono sockets on the rear of the deck, and which led to a huge reduction of vibration transmission to the subchassis (it also greatly reduced the damping of the suspension, so that the deck would bounce, unnervingly, for several minutes). My TOO was long overdue for a service, and had stopped spinning at 45 RPM a couple of years before. The belt was also starting to get a bit loose, so I decided to go for the first two stages of the upgrade, which I supposed would not only fix the existing problems but improve the sound too. Delays in picking up my deck and carrying out the upgrades (Funk are very much a small operation, and so normal business is very susceptible to staff shortages), tilted me into the decision to go for the full Monty and transform my TOO into an Anniversary Vector while my deck was still in Arthur's hands. Out of the box the deck was straightforward to set up, as it only required the platter to be placed on the bearing and the belt installed on the inner platter section using the traditional pink thread. The only new complication was that the Vector, with its two extra pulleys, requires three pieces of thread to help get the belt around the platter, where previous Pinks have only needed one. This is, all the same, a simple procedure, and since the pulleys are part of the same suspended assembly as the bearing and platter, the belt is far less likely to fall off - this was a far-too-frequent occurrence with the PT TOO, where careless handling of an LP would cause the belt to collapse in a slack bundle under the platter. My deck came with a single printed sheet of instructions for installing the belt and connecting to the power supply (the first official instructions for a Pink Triangle record deck that I have ever seen). With my deck the subchassis had already been levelled but, as with all Pink Triangles, this is a simple operation anyway, as the bolts for adjusting the suspension are easily accessible from the top of the plinth. The deck is connected to the external box containing the "KR-Shunt" motor controller, and then turning the knob on the front of the latter starts the platter turning: anticlockwise for 33 RPM (illuminating a green LED) or clockwise for 45 RPM (turning the LED red). The platter takes a little time to start up, which I would guess is due to a low torque from the motor; and the belt is only about half as thick as the one I was used to with my TOO. The final extra components of the Anniversary Vector are the black Achromat, which simply sits on top of the acrylic platter, and a lightweight plastic record clamp, which screws into a thread tapped into the top part of the main bearing once an LP is on the platter. I took about twenty minutes to complete the setup, which was rather less than the time it took me to set up my SME arm on the deck. My Anni Vector now contains very few parts from the original TOO: the only remaining original components are the plinth, platter and lid. I certainly like the look of the new deck, with its glossy black top plate, though this seems likely to be susceptible to fingerprints and scratches. The rounded-off armboard also seems to be a better aesthetic match to the top plate than the old square one in the TOO. The power supply box for the PT TOO was a nicely styled box designed to match the turntable plinth, but was quite bulky - the motor controller box for the Anni Vector, by contrast, is a much smaller black anodised box, and fits unobtrusively onto the top shelf of my rack next to the turntable without taking up too much space. I personally prefer the look of the deck without the Achromat on, but it clearly does what it was intended to, which is to provide a much more direct mechanical interface between LP and platter. Tapping the naked platter with my fingernail gives what I can only describe as a "plasticky" sound, but with the Achromat installed the same tap sounds extremely dead. I haven't tried playing records without the Achromat yet, as its thickness of 5mm or so means that the tracking angle would need readjusting, but my guess is that it considerably reduces coloration. Finally, I like the fact that in standby mode the LED is not lit, where with the old TOO the red LED was on all the time. When my newly upgraded deck arrived, I hadn't listened to a record for about six weeks, so I can't list detailed differences between the original TOO and the Annie Vector. I am also aware that my system has some limitations: in particular, although the Croft Series 5 valve power amp which drives the midrange and treble drivers in my speakers has a gloriously rich and transparent midrange, it does lack some air and detail in the treble. Shortly after my deck returned my DIY line preamp developed a fault which meant I had to swap in my old Croft Super Micro A for line duties and this, although a very fine preamp - again with a lovely rich midrange - is not quite as transparent as some. Finally, my homebrew speakers are very musical and dynamic, and their tonal balance seems neutral and suits my tastes very well, but their placement about twenty centimetres from the rear wall does compress the soundstage into the room a little, so some of the renowned soundstaging strengths of the Pink Triangle decks are obscured. All the same, I was very familiar in general terms with the sound of my system and my records with the PT TOO in place, so here are some general impressions as I have started to play some of my records in the couple of weeks since my Anni Vector arrived. I was certainly expecting lower motor noise and better pitch control, and as a consequence I expected better soundstage definition, and more extended and controlled deep bass. What I wasn't expecting was the impression of total security and stability in the sound. I remember an old magazine review of the Townshend Rock Reference where the author said that when he went back to his old deck after the ultra-stable Rock he felt a little seasick, and I understand this feeling. With the old TOO, I had become used to the occasional slight wobble, but I realised recently that I had almost imperceptibly got out of the habit of listening to my large collection of piano recordings on LP, though I still enjoyed piano music on CD. Probably for the same reason, I had found that complex orchestral music such as Mahler or Stravinsky could become disconcertingly vague in tutti sections. One of the few consistent criticisms in reviews of the Pink Triangles over the years has been of their bass which, although not actually lacking, never had the downward extension and solidity heard in the Townshend Rock Reference or Voyd decks. I have heard a couple of Voyds (the Reference and the Valdi) and been impressed by the tangibility and control, especially in the bass, which the multiple motors seem to give to the sound. The bass of my PT TOO, by contrast, could feel a little insubstantial, so that orchestral double basses didn't have the rasping physicality and sense of size that they have in real life. With good piano recordings, as well as the occasional pitch problem I have already mentioned, the TOO rarely gave that sense of impact that I am familiar with from both real concert grands and from the best CD systems. With the Anniversary Vector both piano and orchestral music are now totally satisfying, and the dynamic headroom has seriously improved, so that bass drum notes can be quite startling. Dynamic contrasts also seem much less restrained now, whether the widescreen cinematic intensity of Pink Floyd's The Wall or the emotional kaleidoscope of Mahler's Seventh Symphony (Bavarian SO / Kubelik). These high quality recordings are now in even more obvious contrast from the compressed sound of eighties digital LPs like Manzanera and Mackay's Up in Smoke, which sound very dull. The shallow dynamics and shrill treble of my early 1980s pressing of Led Zeppelin's Houses of the Holy were revealed all too clearly - I'll have to find an earlier pressing, as I feel this album is unjustly underrated in the Zeppelin catalogue. I listened to Vladimir Ashkenazy's 1974 recording of Prokofiev's Third Piano Concerto with the LSO and Andre Previn, and even at a relative low volume setting this piece was enthralling. This was the first time I have had in my system such a realistic impression of the double basses and bass drum naturally filling a concert hall acoustic. The violin sections had a nice spatial spread and sounded very clear, rather than being homogenised, with a very real-sounding "texture". The piano was very distinct from the orchestra behind it, though clearly part of the same acoustic, and sounded very solid. The thwack of the drum and clacking castanet were very convincing, and the runaway finale kept me sitting up in my chair right until the final bar. The Anniversary Vector seems amazingly transparent, even given my earlier qualification of the limitations of the rest of my system in this respect. As an example, the instruments on the first three tracks of Bjork's Debut are obviously all electronically synthesised, even though their deceptively simple rhythms are pleasingly bouncy. When the fourth track (There's more to life than this) starts, all of a sudden the previously non-existent acoustic expands cavernously and almost vertiginously into the night-club where this song was apparently recorded: the voices of the crowd sound as if they come from the far end of a room, while Bjork's own voice feels very intimate and close. The next track, Like someone in love is very sparsely and naturally recorded, with just Bjork's voice and a concert harp: both are very tangible and present, although clearly not recorded in the same take. Another recording which shows off the imaging well is Pink Floyd's The Wall, even though the soundscapes here are again products of the mixing desk. In One of My Turns the scene in Floyd's hotel room is very vivid, with the groupie walking around the room and into the bathroom (and each of the crashing television sets made me jump, even though I wasn't playing at high volume at the time). Record surface noise was always low with the PT TOO, especially with the SME arm and fine line stylus of the Lyra Lydian, but it seems even less evident with the new deck, and is almost negligible on about 90% of the recordings I have played so far on it. I would guess that the Achromat must form an even more efficient conduit for the non-musical high-frequency ticks and pops than the original acrylic. The new deck also seems kinder to some recordings with a skewed frequency response - for instance my set of Martinu symphonies, recorded on Supraphon by Vaclav Neumann in the early seventies, had an uncomfortably screechy top end on the TOO, but are far more vivid and communicative on the Anni Vector. Overall, I would say I am so far delighted with my Anniversary Vector. It keeps all the strengths of the PT TOO, and in my opinion fixes all of the few remaining shortcomings of that deck. It seems even more neutral and transparent than its predecessor, and adds impressive dynamics and stability to those virtues.